Get all the nutrients and fuel you need from this super easy recipe!! 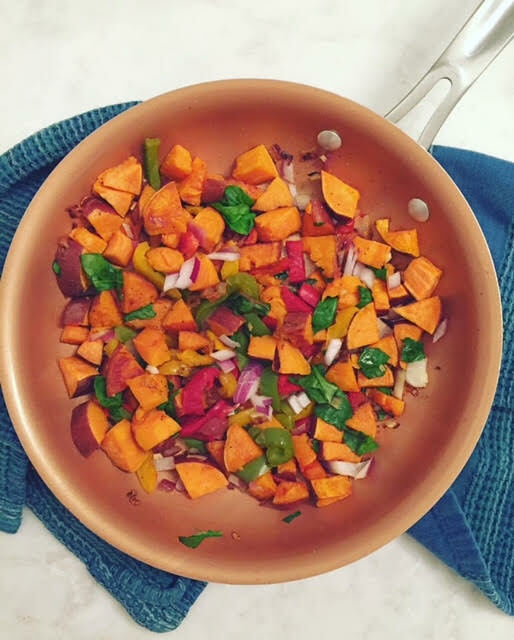 Cube sweet potatoes, dice up the onion, cut-up bell pepper into small pieces, and chop the spinach. Cook all veggies over EVOO or coconut oil on stovetop with a sprinkle of pink salt and pepper, frequently stirring. Cook until potatoes start to soften and brown. Can cover with lid for a few minutes to speed up the process, but do not leave on for the entire time. Remove from heat and top with crushed red pepper and fresh cilantro. Start your day off right with this filling and nutritious breakfast! 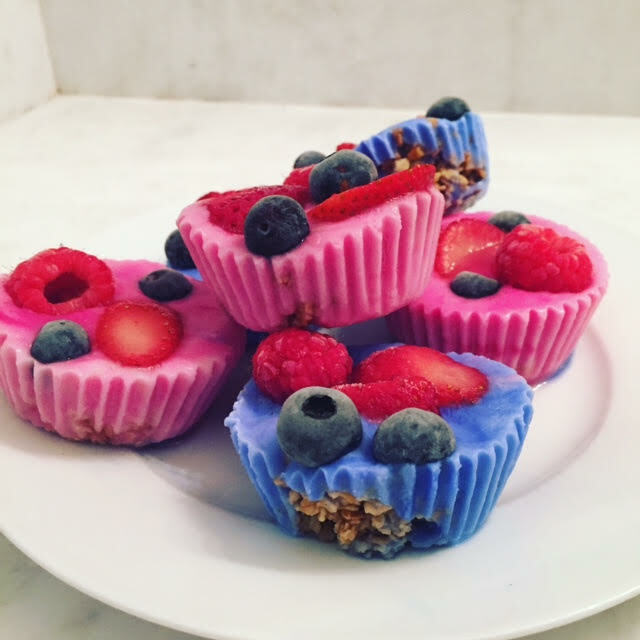 This recipe is dairy and gluten free! Cut (or rip) turkey breast into small pieces and add to stove top pan with a drizzle of coconut or EVOO and sprinkle of pink salt and pepper. Add 1 cup of chopped spinach and diced onions to the pan after about 3 minutes and continue to cook and stir until turkey starts to brown and then remove from heat. At the same time you can scramble the eggs in a separate pan over 1 TBSP of melted plant-based butter and pink salt/pepper. 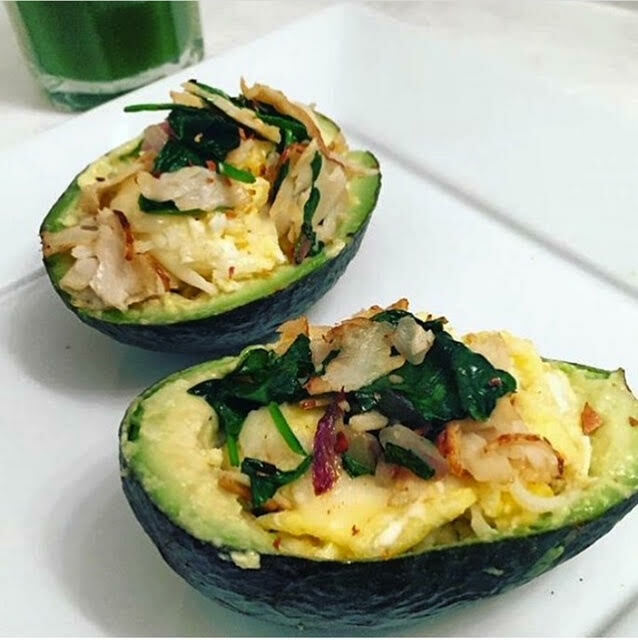 Combine the turkey mixture with the scrambled eggs and fill-up the avocado bowls. Weave in some shredded almond mozzarella while still hot so it melts and can top with additional pink salt and red pepper flakes, chili powder or hot sauce to taste! I love adding fruit to my salads, especially during the late-summer and fall! This salad is both sweet and savory, enjoy! 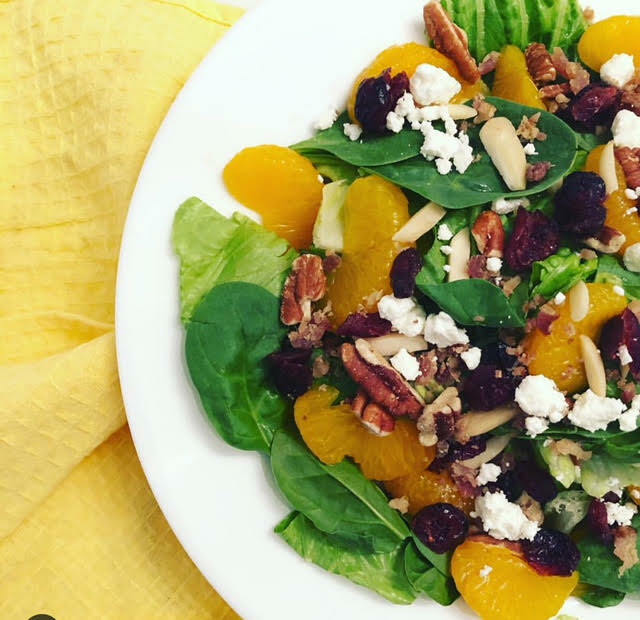 Mix the chopped romaine and spinach leaves in a large bowl, add the mandarin oranges, cranberries, almonds and pecans and toss well. Top with crumbled goat cheese and uncured bacon bits. Dress with an organic poppyseed dressing OR make your own dressing using balsamic vinegar and a splash of lemon juice. This recipe will make 2 servings. Whoever said fruit + veggies don't go together certainly hasn't tried my Strawberry-Poppyseed Salad! This salad is one of my favorites to make in the springtime and summer, as its unique combo is so refreshing on a warmer day! As always, I used all organic and fresh ingredients. Wash and toss the romaine and spinach together in a large bowl or container. Mix in the cut-up strawberries, blueberries, and drain mandarin oranges. Add pecans and sprinkle the feta cheese on top. Drizzle on Poppyseed dressing and mix all ingredients together well. Store in refrigerator or wait to add dressing until right before eating and it may get a little soggy when sitting out. I am not taking credit for this recipe as I got the idea from Whole Foods. 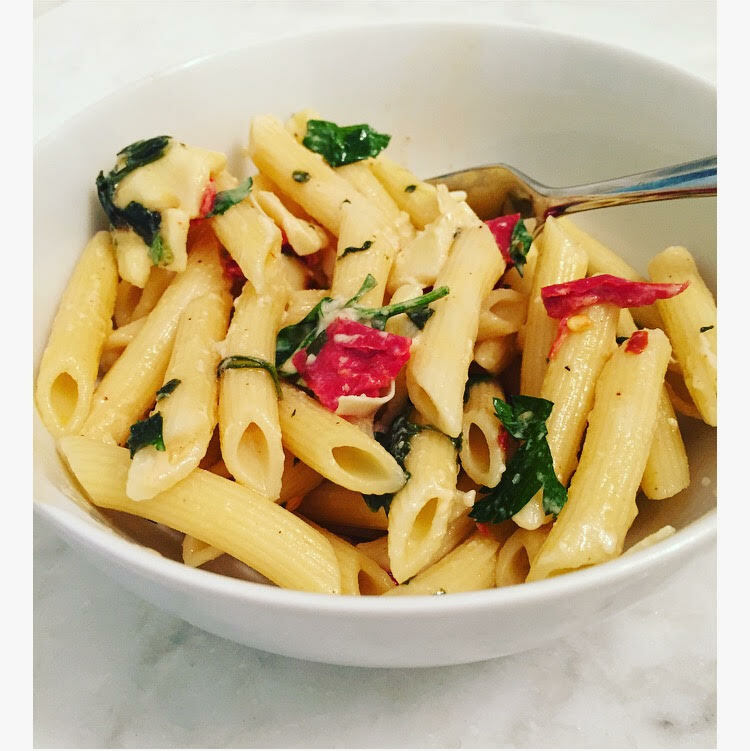 I used to love getting some of their Smoked Mozzarella Pasta from the salad bar, but since changing my diet and lifestyle for lyme disease a lot of the ingredients don't mesh with me anymore. I wanted to come up with a healthier version of this pasta, so I got creative in the kitchen, because seriously that's what I do for fun! Boil water and cook the penne pasta based on the box instructions. When pasta is done rinse noodles with cool water so they don't stick when refrigerated. Cut-up red bell pepper into small pieces or strips, chop up spinach. Cut mozzarella into small square pieces and set aside. Add a drizzle of olive oil to pan on medium heat and add the red pepper and spinach, cover with lid. Let cook until tender, can remove the lid for 3-4 minutes and let finish cooking. To make the sauce: in a bowl combine the 1/4 cup white wine vinegar, 3/4 cup plant-based mayo, 1 tsp chili powder, fresh parsley, 1 pressed garlic clove, and 1 tsp red pepper flakes, stir well. Taste and if vinegar is too potent can add a little more of the plant-based mayo or some water to help lower the acidity. Add pink salt and pepper to taste. Combine the sauce, cooked vegetables and the noodles and stir in the mozzarella chunks. Can add additional red pepper flakes for more spice. Let the pasta salad cool and set in the refrigerator, preferably overnight, but a few hours will do the trick. 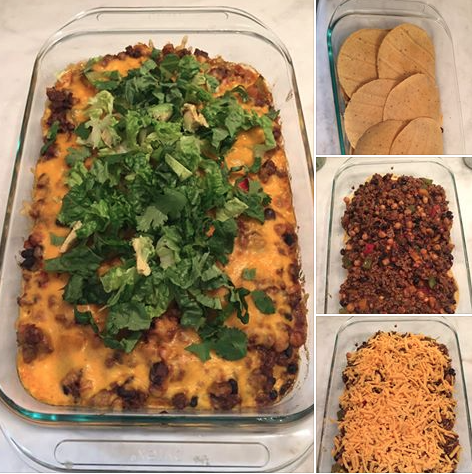 Taco Lasagna: A mexican twist on the traditional comfort food! And it will fill-up the family for more than one dinner! I used all organic ingredients. If you are vegetarian, leave out the meat and add extra beans. For vegan or dairy-free use all beans and a plant or nut based cheese instead. 1. Preheat oven to 350. Brown the ground beef on stove top, mix with taco seasoning. At the same time add a drizzle of olive oil and heat can of garbanzo beans, black beans and diced bell peppers with cumin in a pan on low to medium heat. 2. Once meat is done add the bell pepper/bean mixture to the the meat pan and stir. Add jar of salsa and mix well. 3. Spray the bottom of Pyrex dish or wipe with olive oil. Add 6 corn tortilla shells for the bottom layer. Then top with the meat mixture, then cover with shredded cheese. After that, repeat the next layer by adding another 6 shells, then meat mixture, then cheese. 4. Cook in oven at 350 for 20-25 minutes, until shells are crispy. Let cool and top with chopped romaine lettuce, cilantro and diced Avocado--can also drizzle on some fresh lyme juice. Cut with a knife and serve with spatula like lasagna. This recipe is a healthier version of the famous Panera soup that I developed from scratch. I used all organic and fresh ingredients! This soup is dairy free and you can make it vegan by leaving out the chicken and using all vegetable broth instead of a combo of that an bone broth. Cream-based soups are delicious and satisfying during the winter months, but they can pack lots of extra calories and fat, so this recipe is a better-for-you alternative! Plus, bone broth is one of the best foods you can feed your gut this time of year to help fight and prevent illness and strengthen your immune system. 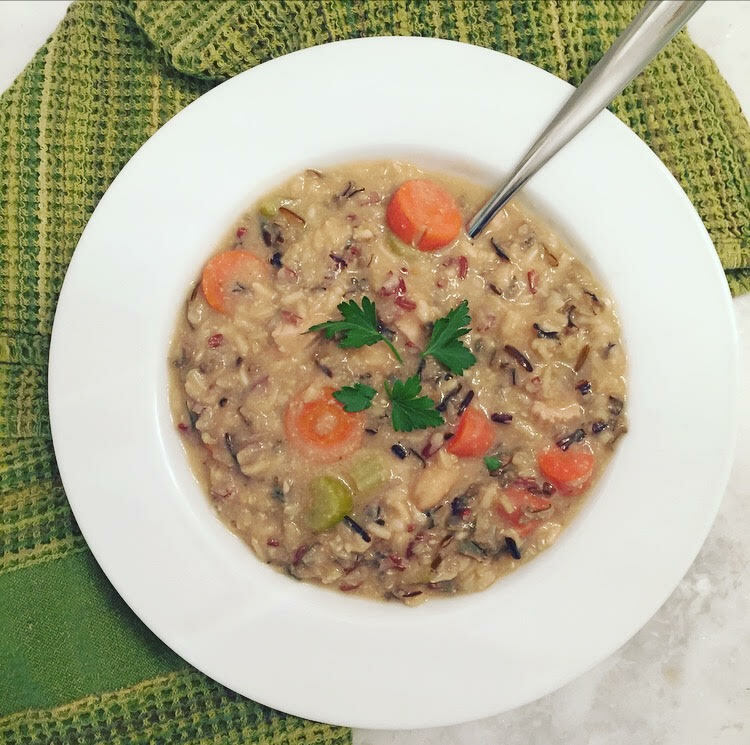 If you are lactose intolerant, sensitive to dairy, or live a vegan lifestyle this is a great way to still enjoy a rich soup! -1 box of organic pre-cut chicken breast or 2-3 small organic chicken breasts cooked on the stove top over olive oil, salt and pepper. 1. Soak the cashews. Can do this overnight or I prefer to boil a small pot of water, remove from heat and then cover the cashews for 15-20 minutes. Drain once the time is up. 2. While the cashews are soaking you can boil a pot of water to cook the potato. Can leave the peel on if you prefer. I used two small golden potatoes and did not peel them prior to boiling. Once cooked set aside to cook and cut into small pieces. You can also cook the chicken breast if you did not buy the organic packaged version. Cook in olive oil with salt and pepper, remove from heat and use food scissors to cut into smaller pieces, set aside for later. 3. Heat a large soup pot on the stove top with olive oil and add cut-up carrots and celery, diced onion, and press the 3 garlic cloves. Stir in 1-2 cups of bone broth and cook until the veggies start to soften. 4. Add the wild rice to the pot mixture for 2-3 minutes. Stir in the remainder of the bone broth and vegetable broth and bring to a boil. Let simmer for 15-20 minutes with lid on. 5. While the rice is cooking in pot, combine the cooked potato, raw soaked cashews, and rinsed beans into a food processor or blender and blend until smooth. I added a little bit of water to help the consistency blend easier. You may want to use a spatula to scrape the sides and blend a few times to make sure the mixture is smooth. 6. Add the cream mixture to the soup pot and stir well. Add 1 tbs of white wine vinegar, 1/4 cup of nutritional yeast, pepper, and salt. If you are using chicken, now would be the time to add the cooked chicken to the pot as well. 7. Cook on low heat until rice reaches desired texture. Make sure to stir frequently to prevent the rice from sticking together or the bottom of the pot. You may need to add more broth or water as the cream mixture will be pretty thick, it depends what kind of consistency you like. I added more broth at the end and let it heat for a little while before serving. Top with fresh parsley and can serve with oyster crackers or fresh bread if you eat gluten. Can store in the fridge and enjoy as left-overs, but may need to stir in more water prior to reheating as it will thicken up from being stored. This soup is super easy and super satisfying for these colder winter evenings!! I used all organic products to put this recipe together! Cut up veggies and sauté carrots in pan with olive oil to soften a bit. Add carrots and parsley to the pot. Add tsp of olive oil to pan and cook chicken breasts with salt and pepper, remove from heat and let cool. Add to crockpot: enchilada sauce, can of corn (undrained), drained and washed garbanzo beans, cut-up chicken, 1 pressed garlic clove, chicken broth, green chillies, fresh cilantro, chili powder and cumin and pepper and salt. Cooking time can vary based on your slow cooker's setting, I cooked mine for around 2 hours, could go longer on a very low setting. This fresh pasta salad is the perfect side dish to any meal! I came up with this recipe using some of my family's favorite ingredients, and I try to use everything fresh and organic when possible. When pasta is done cooking, rinse with cool water to avoid sticking. Add pasta to a large bowl, and combine with all of the ingredients. Add the dressing and cheese last. Chill before serving. Try this recipe as a healthier alternative to wings! It's super easy + you can bring your own taste to it by selection which sauce you would like to garnish with! Let bites cool, then garnish with your favorite sauce. I use Tessemae's All Natural Mild Buffalo Sauce because the ingredients are good quality, but Whole Foods has some good options I have used as well! Serve with blue cheese and celery for the ultimate tailgating snack or party app! This recipe is so quick and easy, even if you’re on-the-go in the morning you can have time to whip these up! This recipe is gluten free and dairy free. Mix together 1 1/2 cups almond flour, 3 eggs and up to 1 cup of almond milk or water. I prefer to use a Pyrex measuring pitcher and whisk to mix together. Add TBS of butter to stove top pan and heat up. Once heated, carefully pour on the mixed-up batter. Make sure to flip pancakes with a spatula a few times to evenly cook. Top with cinnamon and blueberries or strawberries with organic maple syrup. Enjoy! These cupcakes are organic and no artificial colorings were used for the sprinkles or frosting! Every year, 15 million pounds of artificial food dyes are used in U.S. food manufacturing plants. Let’s get real, if I can make my own food coloring from scratch at home these big food companies can certainly find a way to get it done at their state-of-the-art plants without breaking the bank. Artificial dyes have been linked to numerous health issues. In animal studies dyes have caused tumors and cancer, and it is said that yellow #5 causes hyperactivity in children. So, we made our own coloring using safe and organic products. Combine cake ingredients into a large mixing bowl. Stir with an electronic mixer or by hand until batter is thick and there are no clumps. Pre-heat the oven to 350 and full cupcake pan with cupcake wrappers of your choice. Fill holders 2/3 of the way with batter using a spatula or spoon. Wipe any excess batter off the pan and place in oven for 14-18 minutes. Let cupcakes cook until golden…stick a toothpick in to check if done, if it comes out clean you’re good to go! In a food processor or small blender add 1/2 cup of water, handful of yellow carrots and 1 tsp of turmeric powder. Blend until smooth. Add mixture to stove top in small pan and cook on low for 10 minutes. Pour the juice from the pan and TBS of the mixture into a bowl with the vanilla frosting. Stir until the mixture is smooth. Remove cupcakes from pan and let cool for several minutes before frosting. To add the minion facial features use two dark chocolate chips as the eyes along with vanilla frosting, and you can melt a handful of chips in the microwave for about 2 minutes and use a toothpick to draw on the rest of the face. All of the sprinkles shown are from the Miss Jones Vanilla Frosting pack and are made with natural colors (turmeric, beet root, spirulina and paprika).